Are you struggling to take your electrical designs to the next-level due to limited resources and tight delivery schedules? If yes, we can help. Outsource2india's expertise in handling printed circuit board design services for mixed signal, high speed digital and analog power boards sets us apart from our competitors. Our PCB layout services involve usage of highly efficient PCB design tools for innovative printed circuit board design using custom scripts and programs to increase efficiency, augment the current design tools, and improve quality. Our another area of focus is developing printed circuit board designs that can be used to manufacture electronic appliances for domestic, commercial and industrial use, such as televisions, computers, printers, cell phones, microwave ovens, telephones, stereos, digital clocks, amplifiers, synthesizers, and so on. Our customers are extremely satisfied with the expertise we incorporate in delivering complicated projects. We have a design team that includes the most proficient PCB designers in India; who have worked on several projects across multiple industry verticals. Along with our high quality PCB designs, we also provide one of the best customer services. 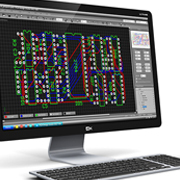 Our qualified and expert designers know how to manage a PCB layout design efficiently without affecting its quality. We also have the provision to keep the customer updated about the design process, starting from the schematic capture of the PCB drawings to the final routing. Every project we handle undergoes various processes to ensure the overall quality and reliability of the product. PCB layout designers at O2I are highly skilled and work together with experts who make manufacturing easy and assist in developing the most efficient PCB boards. Outsource2india offers multiple skill-sets, 24x7 shifts, flexible working hours, regular training programs and strict quality checks, to ensure that we retain our well-established PCB design and layout credentials. Extreme turnaround time and best-in-class prototyping facilities help us turn a simple logical design into a fully functional PCB unit with ease. Being a reputed provider of PCB layout and PCB design services in India, we have the privilege of being associated with various industries like telecom, military, medical, aerospace, industrial, electronics, and automotive among others. By working with Outsource2india, you benefit from the most efficient offsite PCB design services that can play a crucial role in extending the life of your electrical equipment. To outsource PCB layout and design services to India and invest in a long term win-win business partnership, contact us today.